While nearly any digital camera having the capability of 3 megapixels or more will do a decent job, as in nearly all things you do get more capability and higher quality with higher end models. Here are some things to consider if you are planning to purchase a new camera soon. Don’t consider all of these features essential, but each will help give you the capability to do a better job under certain situations. 1. Look for a camera having moderate zoom capability. A focal length that might be called short telephoto is desirable. Focal lengths are still often quoted in “35 mm equivalent” lengths because that is what photographers are used to seeing. 50 mm is considered about normal. For jury-slide photography having zoom capability in the 50-120 mm range is good. Having a wider range is OK, but when it gets too wide accurately setting the exact zoom you want becomes more difficult. The lever that is used on “point and shoot” type cameras is just too sensitive to allow good control. I still prefer a zoom lens that I twist to set the zoom vs one that has a adjusting lever and is driven by a small electric motor. It is just easier to control the manual “twist it” kind. Consider only optical zoom numbers--the wider “Total” or “digital” zoom ranges quoted by some camera advertisements are just hogwash. 2. Lens quality is as or maybe more important than the number of megapixels. For example I would choose a camera with a high quality lens having 6 megapixels over a camera having a lower quality lens and 8 megapixels. 3. The ability to adjust and control exposure settings is very important. While many cameras have this capability the least expensive ones may not. As a general rule, the more expensive cameras give you more control. As a minimum you want what is called “aperture priority”. This allows you to control the f/stop (how big or small is the hole that lets light enter the camera) that the camera will use and, thereby allows you to control “depth of field” (how much--front to back--is in focus). For most situations you want a small aperture (high f/stop) of say f11 or higher. f16 or f22 might be even better depending on the specific piece you are shooting. Another feature you want is the ability to adjust exposure vs that which is recommended by the built in exposure meter. Most camera have this capability although it is easier to use in some. Being able to go completely into manual exposure mode can be convenient at times, but is not essential. 4. Manual control of focus is another feature you will find helpful from time to time. This is particularly true when shooting small items like jewelry. Cameras with automatic focus pick out what they want to focus on. That may not always be what you want to be in best focus. 5. The ability to turn off the built in flash is very important--they are never helpful for this kind of photography. Sometimes, however, a well placed piece of tape will effectively do the job. 6. Unless you choose to go with an electronic flash lighting system, you will want the ability to have a cable (or remote control) shutter release. This allows you to use higher f/stops which require longer exposures. Being able to take the photo without touching the camera is necessary to avoid a blurred photo. 7. While single lens reflex cameras have the disadvantage of being bigger and more complex, you are more likely to find the features described above in this type of camera. Cameras like the Nikon D40, the Nikon D80s, and the Canon Rebel XTi (street prices of about $500, $875 and $600 respectively in Dec 2007) have all of the above capability and more. However if that is above your affordability range a 3-6 megapixel camera of any of a dozen or more brands will have some of the above features for a price of $200-500. Of course it should go without saying--if you already have a digital camera use it for now. Wait until you see what you can do with it and with a setup like is described below before you consider buying another one. If you are about to buy a new camera try to borrow a decent “point and shoot” and a single lens reflex like the ones mentioned above. Give them a test drive and decide which offers you the best combination of features and ease of use. Light tents are made from tightly woven white nylon fabric. The nylon fabric softens and diffuses the light which is directed at the work through the fabric. Alternatives include soft boxes with an electronic flash inside (what I used to use), reflective umbrellas, and two or three other combinations of a light source combined with some means of softening or diffusing the light. Where possible it is often best to use only a single light source; however, with a light tent the light is diffuse enough and the shadows and highlights soft enough that 2 or even 3 lights can sometimes be used to advantage. Graduated white to black backgrounds are the easiest to use and most widely applicable to a variety of craft objects. Whatever background you use, always set it up to be continuous with no “corners” showing between base and wall. My only advice here is to buy a decent one in the range of $75-!50. Look for a quick release fixture for the camera, easy and smooth adjustability, sturdiness, and easy to lock in position. Don’t go cheap and flimsy--you will regret it. I have recently switched to 5000K fluorescent floods and like them a lot. They have a long life, run cool, and are properly color balanced for “daylight” settings on your camera. Floods (whether fluorescent or regular) have the advantage over electronic flash of allowing you to see and manage shadows and hot spots more readily. Yes, you can buy electronic flash units that have “modeling lights” built in which allow you to do the same thing--kind of--but they are more complex to use. The disadvantage of fluorescent floods is that they put out somewhat less light and, therefore, require longer exposures. This makes having a cable or remote shutter release even more important. There are too many variables to give a complete guide to how to shoot your work in a short document like this. I will only try to give you enough to get you started. First set up your camera to be slightly above your work pointing down on it. Adjust the position of the camera and the zoom lens to tightly frame the piece. Set the camera to the highest quality setting (highest resolution and tif or RAW file type if available) and (if your camera has this level of adjustability) for a “film speed” or ASA number no higher than about 800--higher settings introduce to much “noise” into the picture. Use aperture priority and set the f/stop to f11 or higher. Take a few pictures at different exposure levels and different f/stops. Download them into your computer and critically evaluate them. Get as close as you can to a “perfect” photo without using an image editing program. In other words, your photos as they come from your camera should be properly cropped, well exposed and in good, sharp focus. In an initial session plan on spending 2-4 hours going back and forth between your photo setup and your computer adjusting settings all the while. Take good notes on what works and what doesn’t. One of the beauties of digital photography is the rapid feedback you can get vs sending film off to be processed. It shortens the learning curve dramatically. Resist using crutches like Dulling Spray to prevent highlights on glossy work. One small highlight is OK--it helps show the work is glossy. Learn to adjust your lights to get the highlights you want (or don’t want)--Dulling Spray (or hair spray or the like) will “kill” your work. If submitting to a magazine or for printing, don’t resize them. Submit the highest quality (highest megapixel) file you have in RAW or tif format unless the magazine or printer asks for something different. Nearly all journals have a section on their web site telling what their specific needs and requirements are. For use on a web site you want a file that will load quickly but looks good. Even if you are lucky enough to have a high speed DSL or cable internet service, please remember that 70% of Americans are still on slow dial-up connections. Have mercy on them by sizing your files appropriately. Most web pages are sized to about 800 pixels wide. As you do your layout, figure out how many pixels you want to reserve for your photos, i.e. what per cent of the screen do you want your photo to occupy. To make the math easy, lets say you have a horizontal photo and want it to cover 3/4 of the width of the page. That means you need to adjust the file size to be 600 x 400 pixels. You can do this in any number of photo editing programs. Then save the file as a medium quality jpeg before you move it into your web page. For submitting files for jurying, follow the instructions provided by the organization. However only very expensive digital projectors have a resolution higher than 1024 x 768 pixels. There is usually no benefit to be had by submitting files of higher resolution than this. If your files will be shown several on the screen at once, file sizes over about 450 x 300 will get not added benefit and will take longer to load into the computer for projection. But, again, read the specific requirements for the show you are submitting to. I have no financial interest in any of these sources. They are just places I and some of the potters on Clayart have found to have good prices and service. Light Tents: tabletopstudio.com, ezcube.com or ebay.com. Sometimes exactly the same tent will be offered on ebay at a price lower than the same store sells it from their web site. Sample price: a 30 inch EZcube on ebay, $90.00 including shipping. Fluorescent Floods: The fixtures can be bought at a hardware store or from places like tabletopstudio.com. Get at least 10 inch ones; 12 might be better if you can find them. You will also want adjustable light stands unless you have volunteers readily available to hold the lights for you. The 5000K bulbs can also be bought at tabletopstudios.com, but 1000bulbs.com usually has a better price. Several of their compact fluorescent sizes are available in various “degree Kelvin” ratings. Choose one that is 5000 or thereabouts. Slides made from digital files: try slides.com or gammatech.com. They are only a couple bucks each. 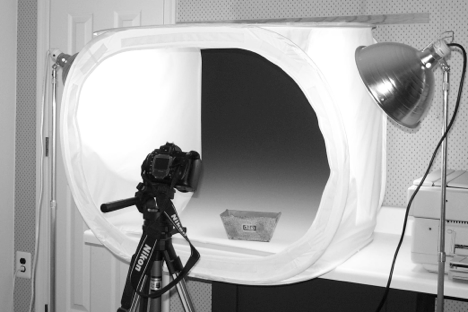 Additional Information: On using light tents for shooting all kinds of items: ezcube.com. Their section on shooting jewelry looks particularly good. It is difficult to find information on shooting jewelry.